When you sign into Stockfuse today, you’ll notice that Stockfuse Continuum, our flagship stock trading game, has been renamed “Stockfuse Continuum (US).” That’s because we have officially launched the second Stockfuse Continuum game – Stockfuse Continuum (London). That’s right, Stockfuse is going international! Stockfuse Continuum (London) brings our highly realistic and powerful virtual trading games to the UK market, allowing you to trade stocks listed on the London Stock Exchange. Like its US sibling, our UK game features an industrial-strength trading engine, real-time trade execution, advanced performance analytics, our signature report card, even a transaction cost model specifically calibrated for the UK market. Best of all, all of these features are immediately available to you, without you having to download an updated app – we’ve spent the past few months adding these features in the background! This is just the beginning of our global ambitions. We look forward to sharing more exciting developments with you in the near future! August was an extraordinarily busy month for Stockfuse and we’d love to discuss some of our latest developments. One piece of feedback we’ve received from our users is that we should provide better tutorials and educational material. To fulfill this request, we have added a new web property to the Stockfuse family – the Stockfuse Wiki. This wiki features a complete user guide for our mobile and web apps. You can also find various educational articles and even a glossary. We hope the wiki will help you navigate around Stockfuse more easily and discover some features you previously didn’t know about! In addition, we have begun preparing for a major global expansion. We rolled out several updates over the course of the month to provide complete support for international trading. For example, you may have noticed that all the ticker symbols now have the associated exchanges displayed. We’re still finalizing a few more details but we’ll be unveiling international trading games in the very near future. We are also working very closely with our corporate customers on a number of major initiatives and can’t wait to share them with the community. Until then, stay tuned and happy trading! Three days ago, we released Stockfuse for iPhone v6.0. Shortly after the release, we received several reports that the app was crashing. We immediately investigated the situation and ascertained that the crashing was caused by some code that didn’t work with iOS 7. Although iOS 7 represents only 5% of our user base, we want as many iPhone users to enjoy Stockfuse as possible – hence v6.1 is here! Special thanks to Apple for expediting the app approval process for us! In addition to fixing up the iOS 7 issue, this update does come with one new feature. When you go to any stock page, we now display far more details than just stock quotes. You now have access to real-time fundamentals data such as market cap, daily volume, price-to-earnings ratios, etc. These metrics should help you make more informed investment decisions. We thank everyone who emailed us and rated the app to let us know of issues. Although it always saddens us to receive 1-star ratings, it does get us alerted to issues you’re experiencing. It also helps make everyone’s Stockfuse experience better. So keep the feedback coming! Stockfuse for iPhone v6.0 is now available in the App Store. This update provides full support for TradeEngine 3, an industrial-strength order management system we announced earlier this month. This means that you can now place limit orders from your phone! This is one of the most requested features from our users, and we cannot be more proud to fulfill it. The Orders page has also received a much-needed facelift to go along with the new TradeEngine. In addition to cleaning up the cluttered UI, you can now use this page to cancel limit orders and other queued orders. We have also made substantial improvements to our notifications system. When an order is rejected for whatever reason, we’ll now send you a push notification so that you can take appropriate actions. This is particularly important for limit orders that may not receive an immediate status update. There are also several small tweaks that position us for the future. For example, we now display the primary exchange of a security on the stock page and in search results. Even if two stocks have the same ticker, it should be immediately clear which is the one you’re after! We hope you enjoy the new app. As usual, please let us know how we can make your Stockfuse experience even better! The Participants tab provides a bird’s eye view of every trader in a game and quick access to their portfolios, report cards, and exportable PDF reports. The Moderation tab (premium games only) allows administrators to easily moderate content submitted by contest participants. The Pulse tab (premium games only) provides a summary of activities in a game, including page views, session durations, etc. The data is further broken out by web and mobile visits. The Download tab allows you to quickly export key data into a beautifully formatted Excel spreadsheet. The Settings tab allows you to configure different aspects of a game after it has been created, including registration dates, privacy, etc. We hope these improvements make running games on Stockfuse even more efficient and pleasant! As planned, we have completed a major upgrade to Stockfuse over the 4th of July weekend, and it was huge. First, TradeEngine 3, our industrial-strength order management system, has gone live. We have completely rewritten this vital Stockfuse component from scratch. Not only is it leaner and faster, it is also far more capable, providing support for advanced features such as limit orders. Traders using our website can enjoy the full benefits of TradeEngine 3 immediately. Our mobile apps have also begun using the same engine for trade execution, and an update supporting other advanced features is coming soon to the App Store near you. We have also redesigned the Stockfuse user interface. The design goals were twofold: 1) to unify the design language across the web and our mobile apps, providing our users with a consistence experience, and 2) to enhance social interactions. These goals are particularly noticeable in the design of the posts. Not only do they share the same look-and-feel as their iOS counterparts, they promote social features such as voting, commenting, and bookmarking. We now provide real-time fundamentals data such as market cap, P/E ratio, dividend yield, volatility, etc. We have enhanced the algorithm behind the Stockfuse sentiment score. Furthermore, we now display three-month rolling histories of these scores, giving you a sense of how sentiment is evolving in the market. When you execute a trade on our mobile apps, your web Dashboard, if it’s open, will automatically refresh itself without you having to reload the page. Your portfolio dashboard now displays 1-day P&L for each position. When you close a position, we now continue to list it on your Dashboard during the current trading day. This allows you to reconcile your daily P&L much more effortlessly. The P&L contribution report now provides real-time P&Ls as well, instead of being 1-day delayed. Portfolio returns in the sidebar now update every minute, instead of every 15 minutes. When you hover over a stock symbol, the popover now provides the latest market price, saving you a trip to the stock page. The order submission form now displays the market price of the security you intend to trade. We also check your inputs more diligently, making sure that there are no erroneous entries. We even optimized the search box, making search results more relevant. This upgrade has been months in the making and we cannot be more proud to deliver it. As usual, if you have any feedback and suggestions, please share them with us! 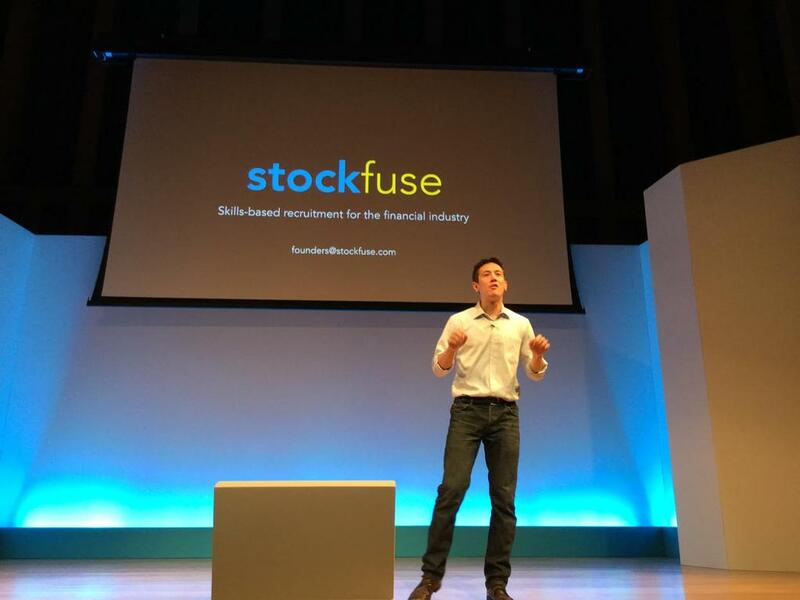 We’re proud to announce that Stockfuse graduated from the Barclays Accelerator powered by Techstars this week! The Stockfuse team was one of ten teams selected from over 500 companies around the world to reinvent the financial services industry. Over the past three months, our mentors from both Barclays and Techstars spent an enormous amount of time and effort helping us refine our business model and our vision. We’d like to take the opportunity to thank our mentors for all the insights and help we’ve received! Along the way, our users have also provided lots of feedback that has helped us to rethink the future of Stockfuse. For everyone that has used Stockfuse, emailed us your thoughts, and filled out our surveys, we’d like to express our gratitude as well. We are laser focused on delivering the best and most innovative simulated trading platform in the world, helping students showcase their financial skills and find their dream jobs. We also want to help everyone else become a better investor. We have a number of big announcements to make in the coming weeks. So stay tuned! Some major changes are coming to Stockfuse, and we’d love to give you a glimpse into the future. Stockfuse is available both on the Web and as mobile apps. Right now, our website has a very different look-and-feel from our apps, but we want to provide a consistent user experience across platforms. To accomplish this goal, we spent the past few months redesigning every component of our website. The new user interface adopts the same design language as our apps, making the UI much cleaner and more modern. It is also more functional than ever, providing faster access to key features on Stockfuse. But it’s not just the user interface that’s changing. 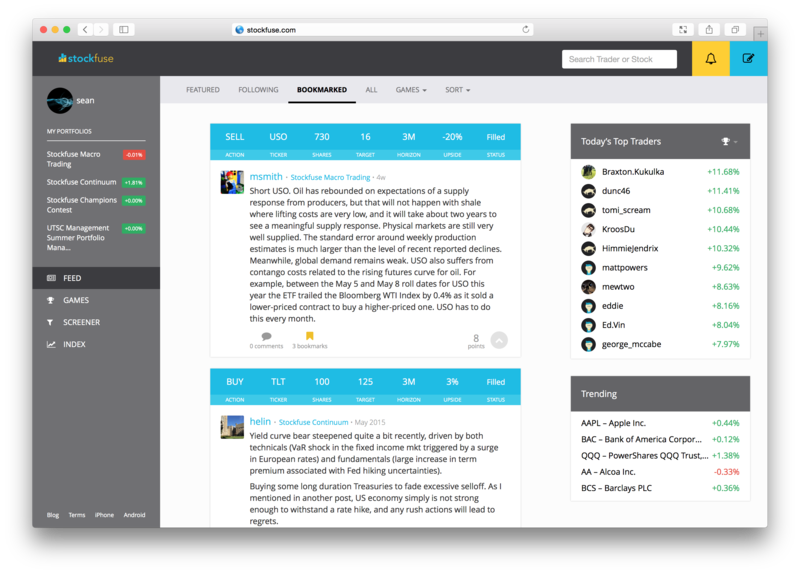 Along with the new design, we’ll be launching Stockfuse TradeEngine 3. Our mission has always been to provide the most realistic trading games in the world. Almost a year after our public launch, Stockfuse remains the only virtual trading platform that’s Reg-T compliant. It is also the only platform powered by advanced features such as Market Impact Models. But we’re not standing still. We’ve completely rewritten our trading engine from scratch. The new TradeEngine comes with some of the most requested features, such as limit orders. It is also leaner, faster, more capable, and more reliable. We believe TradeEngine 3 will provide an unrivaled simulated trading experience to our users. We’re making final preparations for these upgrades and we can’t wait to deliver them to you in the next few weeks! Stockfuse for iPhone v5.0 is now available in the App Store! We’ve redesigned the look and feel of our interactive plots to improve your experience. We are also pleased to introduce v1.0 of the Stockfuse Widget! Now you can check on your portfolio’s overall performance without having to open the app! As we’ve mentioned recently, Stockfuse is undergoing a number of major transformations. We can’t wait to share more updates with you in the coming weeks! @bigdod69 was up a whopping 79% return last month, netting $65k from $CMCM. @yzhao39 was up an enviable 51%, driven by a successful bet on $YOKU. @Zulu1720 returned 48%, gaining $42k from small cap names such as $IDRA. @HelloWolfgang was up 40% after making an admirable $50k from $AMCN. @datpo returned 35%, reaping $38k from $AMAG. Please join us in congratulating these amazing stockfusers! If you’re interested in the Champions Program, please refer to stockfuse.com/champions .